The development of children’s motor and cognitive skills is closely tied to play, especially to the forms of imaginative and role play. Imaginative play is a crucial element that helps kids learn about the world that surrounds them and their role in it. Through these forms of play kids explore the world and by observing it they learn what happens around them and learn the elements in the surrounding environment through their vision, touch, smell and taste. Studies have shown that children’s physical and mental development is most effective when they are engaged in this type of play. This is due to the fact that during imaginary and role play kids absorb not only knowledge but experience as well and in this way make sense of the world. As a parent you have probably caught your kids playing under the dinning table, under chairs covered with a blanket, in the wardrobe or behind the couch covered with pillows from above. This means that your kids can turn any corner in the house into their personal place to play alone or with their playmates. It is true that the mess they make after you just finish cleaning the entire house can be really annoying, but don’t blame it on your kids, they would do anything to arrange a place to play in and there is nothing you can do about it. But if you think about it, you do have a way out; why don’t you save yourself from such unpleasant situations and buy play tents for kids? 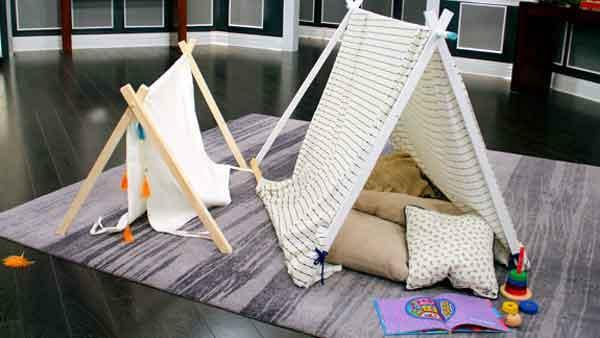 Play tents for kids are one of the most important toys that have a great educational value. However, most parents, lured by the most advertised expensive toys often overlook the importance of buying play tents for their kids. If you are one of them, stop right here and take a look at the four most important reasons why you should get your little ones a play tent. So, let’s see why play tents for kids are teachers of important things. Playing in tents requires a lot of moving and crawling. Also, tents are the perfect place for playing a range of games, such as building blocks and playing with puzzles. These and similar games are proven to engage different motor skills. By repeatedly playing such games kids can develop and strengthen their motor skills. Crawling is a form of physical activity that has been proven to develop and strengthen the coordination of the brain hemispheres. This is one of the most noteworthy benefits that are associated with the games that include a lot of crawling and other similar activities. Playing in tents promotes creative play, while creative play provides an array of benefits for children’s development. It has been proven that creative play has a positive impact on the physical and cognitive development. Also, creative play helps in forming a solid emotional health and makes it easier for kids to socialize within a group. Most of the games taking place in play tents for kids include group play and with that they enable high level of interaction. Interaction with other kids is one of the greatest benefits for children as in this way they learn how to communicate between each other, while learning that they should respect the needs, wishes and opinions of others. This is an important skill that prepares kids for further integration in the society.